Jam Roly Poly is the ultimate comfort food- dense, doughy, jammy and covered in custard. The traditional British school dinner dessert is usually made with suet but I’ve swapped this for healthier coconut oil which goes amazingly well with the yummy raspberry CHAM & desiccated coconut filling. Don’t be put off from making this one- it may look a little fiddly but it really is fool proof…! Serves 8. Preheat the oven to 180 degrees. Sift the flour into a bowl then add the pinch of salt, vanilla powder and coconut sugar. Roughly combine then add the soft coconut oil, maple syrup, coconut milk and whole mylk. Combine with a metal spoon to create a dough. Flour your surface and use your hands to kneed the dough for a couple of minutes. Take a piece of greaseproof paper roughly the size of a baking tray and sprinkle a quarter of the desiccated coconut on top. Transfer the dough to this and roll it out to into a rectangle. Spread out the CHAM then sprinkle over three quarters of the desiccated coconut. 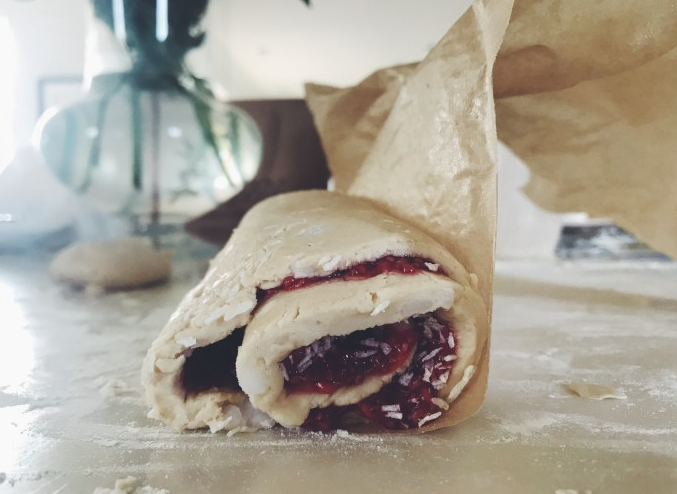 Use the baking paper to help you create the roll. After you’ve rolled it up, squeeze the ends to stop the jam from escaping while it cooks. Sprinkle the rest of the dedicated coconut on top. Wrap the roll in the grease proof paper (nice and tight) and then double wrap it in foil, twisting the ends to make sure it is sealed. Put a rack/grill tray within a roasting tin and set the foil-wrapped CHAM roll on this. Pour boiling water into the tin and make sure the water doesn’t touch the roll. Bake for 1 hour. Keep and eye on the water as it may need topping up whilst it cooks. Remove the layers of foil and baking paper from the roll- be careful- it will be hot!